If all of a sudden you can’t unlock your car due to a break-in or rusting, it might be time to replace your door lock completely. Sometimes this will involve fixing the internal parts of the lock itself. But it could also require replacing the entire lock if the interior of the lock is faulty, has been broken or is jammed. If your vehicle is broken into, many insurance companies will require you to have new locks installed. Therefore, your locks will need to be rekeyed or replaced so that any key that was lost or stolen can not open the car. This can be done for all vehicle locks, no matter the make and model. As required by most insurance companies, we can reprogram the existing keys so any spare key that was lost or stolen will not start the car. In these cases, the lost or stolen keys will have nothing in common with the new keys. Regardless of the type of repairs or replacement needed, new keys will have to be created in terms of safety measures. This means your new locks will be restored to their original level of security. We can also rekey the door locks to the ignition lock. Also, vice versa so the vehicle will continue to work with one key. Do you want to change your car door lock? If you need to change your car door locks, the first piece of information we need is the exact make and model of the car in order to determine the parts required to change or fix the lock. We have a large range of locks and key blanks used for almost all door lock replacements. When making the changes with electronic keys, the technician also needs to make sure that the key will still communicate with the car. This will make it so locking and unlocking the car will be seamless with a new key. You will not be locked out or activate the car alarm. This entire process is something our professional locksmiths can do with all the necessary tools. 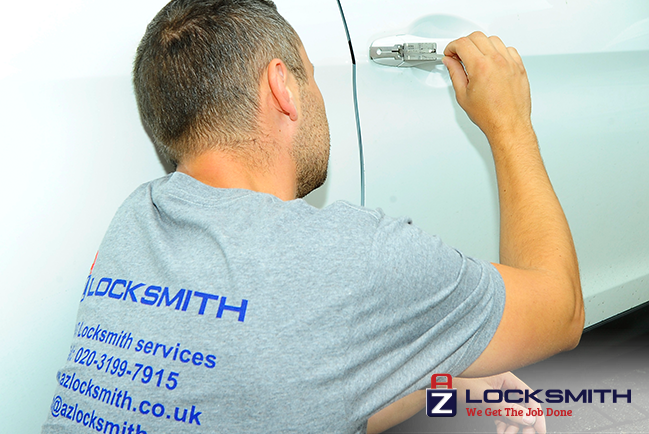 AZ Locksmith has years of experience in repair and fixing of door locks for vehicles. If you encounter any problems with your door lock replacement, don’t forget that we also provide a warranty on our service. Moreover, we offer affordable and fixed prices and we don't charge any extra fees.